Researchers led by NASA's former chief technologist are hoping to launch a satellite carrying water as the source of its fuel. The team from Cornell University, guided by Mason Peck, want their device to become the first shoebox-sized "CubeSat" to orbit the moon, while demonstrating the potential of water as a source of spacecraft fuel. It's a safe, stable substance that's relatively common even in space, but could also find greater use here on Earth as we search for alternatives to fossil fuels. Until we develop a warp drive or some other futuristic propulsion system, space travel is likely to rely largely on the kind of propellant-based rockets we use today. These work by firing gas out of the rear of the vehicle in a way that, thanks to the laws of physics, pushes it forward. Such propulsion systems for satellites need to be lightweight and carry a lot of energy in a small space (high energy density) in order to continuously pack a powerful punch over the many years, or even decades, that the craft are in orbit. Safety too is of prime concern. Packing energy into a small volume and mass in the form of a fuel means even the slightest issue can have disastrous consequences, as we saw with the recent SpaceX rocket explosion. Putting satellites in orbit with any form of unstable fuel on board could spell disaster for expensive hardware or even worse, human life. Water is a way around this issue because it is essentially an energy carrier rather than a fuel. The Cornell team isn't planning to use water itself as a propellant but to rather use electricity from solar panels to split the water into hydrogen and oxygen and use them as the fuel. The two gasses, when recombined and ignited will burn or explode, giving out the energy that they took in during the splitting process. This combustion of gasses can be used to drive the satellite forward, gaining speed or altering its position in orbit of whichever desired planet or moon is the target. Solar panels, with high reliability and no moving parts, are ideally suited to operate in zero gravity and in the extreme environments of space, producing current from sunlight and allowing the satellite to actively engage on its mission. Traditionally this energy is stored in batteries. But the Cornell scientists want to use it to create their fuel source by splitting the on-board water. The proposed process – known as electrolysis – involves running a current through a water sample usually containing some soluble electrolyte. This breaks down the water into oxygen and hydrogen, which are released separately at the two electrodes. On Earth, gravity would then be used to separate the gasses so they can be harvested and used. In the free-flowing zero gravity of space, however, the satellite has to use centrifugal forces from rotation to separate the gases from the solution. Electrolysis has been use in space before to provide oxygen supplies for manned space missions without the need for high-pressure oxygen storage tanks, for example on the International Space Station. But instead of sending water into space in heavy loads on rockets, we could also one day extract it from the moon or asteroids. If the novel approach of using both the hydrogen and oxygen for satellite fuel proves successful, we could have a ready source of it waiting for us in space. This means it could shape how we power at least some of the spacecraft of the future. As is often the case, developments in space technology are pushing concepts that have the potential to help overcome significant energy problems here on Earth. Electricity is really difficult to store and, as we increase our renewable energy supplies, we need to buffer the supply and demand. Wind and solar farms are really inefficient forms of renewable energy, not because of problems with the generating technology but because we often cannot do anything useful with the energy that they produce. The electricity grid struggles at times of high production and low energy need. The answer, as in outer space propulsion, could involve using surplus electricity to split water into hydrogen and oxygen. 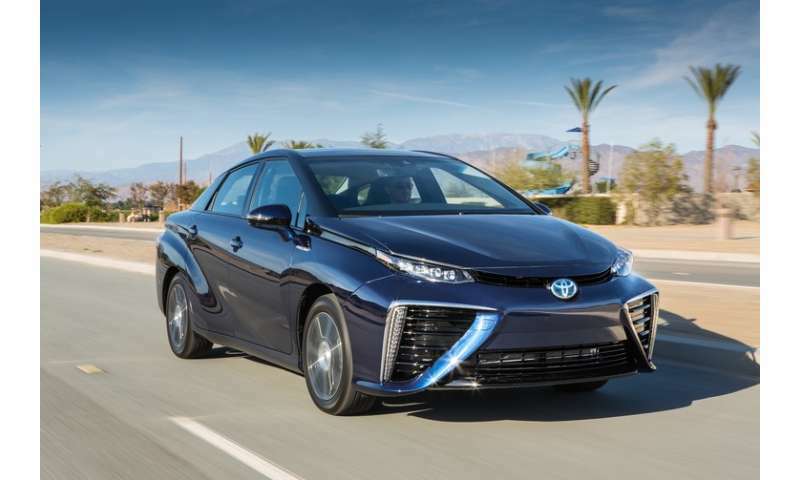 This produces a storable, transportable commodity in the form of hydrogen fuel. When the energy is needed, it can be released by recombining it with oxygen from the atmosphere. This can either be done in a fuel cell to produce electricity again, or by burning it in a combustion engine or a hydrogen gas burner. Welsh start-up firm Riversimple – along with major car manufacturers Toyota and Volkswagen – is already producing hydrogen fuel-cell cars. So if the hydrogen is produced from solar energy in the same manner as Cornell's satellite, this space technology could become part of your everyday life sooner than you think. "Water is a way around this issue because it is essentially an energy carrier rather than a fuel." -Some would suggest it can be a fuel as well. "The Cornell team isn't planning to use water itself as a propellant but to rather use electricity from solar panels to split the water into hydrogen and oxygen and use them as the fuel." -But using a hydrino engine as a power source instead would be more elegant yes? This is a great idea because water can be brought to the satellite by drone rocket or shuttle type craft and refueled in a safe manner like fighter jets are refueled by a refueling planes today. The link is about Randell L. Mills' theory of classical (not quantum) atom theory, that treats electrons as shells of charge, current and spin distributions around the nucleus and which after a while starts recovering some quantum theory formulas and then claims that atoms can have energy levels caharacterised by inverse-integer numbers (n=1/2, 1/3, 1/4) instead of integer ones, which would give them energies below the n=1 ground level, hence the capability of producing energy from collapsing them below n=1. Collapsed H atoms are called hydrinos. Energy production values for water would be 2.78 GJ/kg. His theory is highly contested (you probably guess why). He published a lot in Physics Essays, but also in some serious journals (e.g. Applied Energy). His claims started in 1991 if I recollect well. I do hope his claims materialise and he can show us soon the big money he made from energy production. For now I don't buy it. You are better off using H2 and O2 instead of a solar powered ion engine if you don't want permanent thrust, but only at a given time. Until then you can use the permanent solar energy to produce H2 and O2 and store them until necessary. If you want permanent thrust then direct solar powered propulsion is better. It is questionable whether a system of water storage + solar cells + electrolyser + short-term storage of hydrogen and oxygen + pumps, valves, controllers and burners would be more mass-efficient than simply sending liquid or high pressure hydrogen and oxygen up with the spacecraft at the outset. Since the idea is to give craft the ability to harvest fuel elsewhere (besides Earth) such a system does make sense to me. It may be inefficient, but the infrastructure for liquefying and storing oxygen and hydrogen is then not needed. His theory is incidental to the working machine he is apparently constructing. He is doing engineering and product development, not science. And if it does happen to work, a LOT of very sweaty and frantic scientists are going to be running around trying come up with their own theories of how it works. Is Mills making dark matter as he claims? That would be a very BIG source of anxiety. Whatever Mills does, I want to see how much money he makes from energy production. I don't care for "scientific proof" from him, just to see him get rich by producing energy. That would make me pay attention to his theory. Youtube is full of proofs of net energy production by bizarre means, even out of nothing. I don't miss that. What I miss is one of those guys getting rich, and not from selling books or plans or machines, but from plain energy production. I can't remember when I heard about one getting rich that way. My apologies in advance if I am missing something fundamental, but why not not use steam as the propellant ? Use the power from the solar cells to keep some or all of the water in liquid form and pump it through a heating coil under pressure then exhaust it as steam. No explosion hazard, well, in the chemical sense at least. Thermal storage of energy is not as efficient as chemical storage, so it is better to keep it as hydrogen+oxygen. Though one would have to factor in the necessary mass of the gas tanks. I think the gases are meant to be kept as liquids. + a system that brings water to the right temperature for electrolysis. Solid or gas phase are probably not desirable. I think we need to stop our backward approach to space exploration. The rocket scientists and Mars groupies are constantly talking about new technologies to provide energy, water, and food for deep space travel and Mars colonization. But, any technology for generating energy or surviving in a water less, desolate environment can be applied to helping the human condition right here on Earth where it can be carefully evaluate and tweaked to optimum efficiency and then applied to exploring space and settling other planets. We have millions of desperate people who are starving and wanting for energy and housing. Many of them can't even find clean water or dispose of waste in a sanitary manner. It's stupid to expect a technology to work in outer space if we can't make it work effectively here on Earth first. You can't walk until you learn to crawl first. "My apologies in advance if I am missing something fundamental, but why not not use steam as the propellant ?" Precisely. It's called an arcjet, it already exists, and it gets far better performance than GOX+GH2, as well as not having to deal with the losses and complications of electrolysis. The one thing that a GOX/GH2 thruster has over an arcjet is the ability to do high impulse maneuvers (hard thrusting), at least not without significant power storage mass. But then again, GOX/GH2 thrusters would requires tankage for that, which is heavy, so that doesn't really buy them anything. "But using a hydrino engine as a power source instead would be more elegant yes?" TheGhostofOtto1923, keep your scientifically-illiterate frauds to yourself. Some would suggest it can be a fuel as well. No. Yet another fraud almost as bad but, even more flakey than Rossi - where the heck did you go to school TheGhostofOtto1923 ? Do you have intellectual equipment to understand Hydrogen atom is the most keenly studied at all possible levels, ain't no lower ground state as BLP claims. Simple experimental methods TheGhostofOtto1923, his "demo" just like Rossi's is clouded in severe obfuscation - encasing it in thermite FFS ! Blatant fraud relying on wow factor smoke-mirrors (solar panels) - ugh ! .. using a hydrino engine as a power source instead would be more elegant yes? Where is the Physics, the mass/energy flow equation - Eg where is a basic calorimetry experiment properly audited ?